Filling the places of my predecessors, it is my duty to continue to improve and build upon their greatest principles. I’m committed to a continued push for greater student success in the district while supporting more teachers. We cannot afford to let the hard-fought progress we’ve made in our public education system slip away. Would you like me to speak to your group regarding DISD or the community? Schedule a meeting today. District 2 voters have spoken loudly and clearly, and I am humbled by your support. 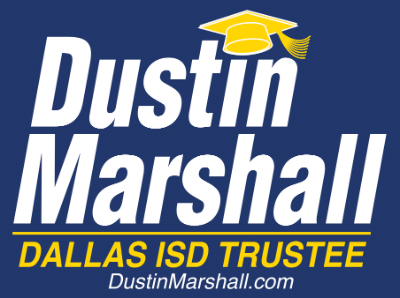 With over 66% of the vote, you have elected me to serve as your District 2 representative on the DISD Board. I am very grateful for the confidence that you have placed in me, and I promise to work tirelessly to help improve outcomes for kids – both in District 2 and beyond. I am grateful to the hundreds of DISD parents, teachers, community members, students, elected officials, neighbors, and education advocates who share my vision for the future of our schools. I’ve met so many community members that recognize the excellence within DISD and are willing to fight for further improvement. I am proud to serve you on the Board, and I am very grateful for your support of our kids. I will eagerly seek your feedback and advice during my term, and I will be in touch over email and social media with information about future community coffee chats. If you’d like to attend future discussions, please sign up here!